Atletico Madrid have published a tweet questioning three decisions made in their 3-1 derby defeat to Real Madrid on Saturday. They call into question the decisions made by referee Estrada Fernández in relation to the penalty given to Madrid, Alvaro Morata's disallowed goal and a penalty call which didn't go in their favour. The tweet features images of the three events, as well as an emoji which clearly suggests they do not agree with the on-pitch calls. 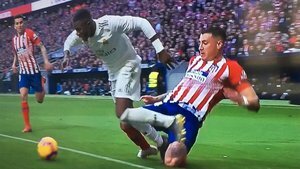 Atletico complain that Jose Maria Gimenez's foul on Vinicius Jr. was outside the box. Madrid were given a penalty, with Sergio Ramos scoring to make it 2-1. They also show an image which appears to show Morata is onside. The forward went on to score but the goal was ruled out for offside after a VAR review. Finally, the Rojiblanco believe they were denied a clear penalty when Casemiro fouled Morata in the box.